The festive period is nearly over, but there’s still so much to look forward to on television in the New Year on BLAZE. In the most dangerous of winter conditions, a local heavy recovery firm helps struggling highway users. 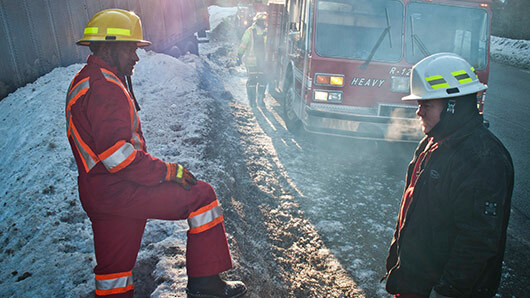 This documentary series follows the rescuers’ lives as they battle the cold and ice to ensure traffic runs smoothly in one of the world’s most dangerous jobs. Forged by Fire is the original competition series where four world-class bladesmiths compete to create the best usable knife, able the withstand the most stringent of challenges. Set in a future where the ice caps have melted, leaving civilisation lost under the sea, communities of ‘drifters’ scour the oceans for a mythical island known as ‘Dryland’. New documentary series UFO Hunters examines some of history’s most intriguing UFO accounts and the evidence supporting them in order to answer the question: are we alone in the universe? In a future where Manhattan is a high-security prison for the most notorious of criminals, the President is trapped inside the city when his plane is hijacked. Ex-Special Forces Agent and convicted bank robber Snake Plissken (Kurt Russell) is offered his freedom in exchange for rescuing the President in this thrilling escape mission. The series where professional buyers bid for repossessed storage units. Don’t miss heated auction battles, lost treasures and auction disasters in this brand new series of Storage Wars. Based on the popular video game, Doom is the story of what happens after humans colonise Mars. When something terrible takes place in a research facility on Mars, the facility is quarantined and an elite team of soldiers is sent in to learn what exactly happened there. These shows and films will all broadcast on BLAZE (Freeview 63) in 2018. « POLL: What was the best Christmas soap showdown in 2017?